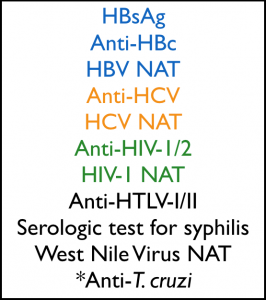 Several things to note from this list: We perform three tests for hepatitis B detection. Four of the diseases are detected (at least in part) by nucleic acid testing: HIV, HCV, HBV, and West Nile Virus. The “*” by anti-T.cruzi testing is because that is the only test that is only required ONCE in a U.S. donor’s entire lifetime!